The new law here making the administration of nitrogen gas the second alternative when the state executes people is simply a reminder of how barbaric the death penalty remains in Oklahoma. Gov. Mary Fallin signed the bill into law about 10 days ago. The bill is a response to the botched execution by lethal injection of convicted murderer Clayton Lockett last year and the dwindling supplies of drugs used in the process. Lethal injection in death penalty cases, first passed by law in Oklahoma, still remains the principal form of execution here. Executions in Oklahoma, Florida and Alabama have recently been halted by the U.S. Supreme Court, which is hearing a case brought by Oklahoma inmates over the state’s lethal-injection process. Meanwhile, drug companies have been put under pressure to stop manufacturing the types of drugs use in lethal-injection executions or to stop supplying them to states for that purpose, and this has created a shortage. Whatever the outcome of that court case, the death penalty, in general, and Oklahoma’s apparent zeal to apply it, remains morally dubious. The recent botched execution of Lockett-he kicked his legs while his body squirmed during the process before dying 43 minutes after the drugs were administered-put the state in the media spotlight in a negative manner once again. The nitrogen gas bill does the same thing. 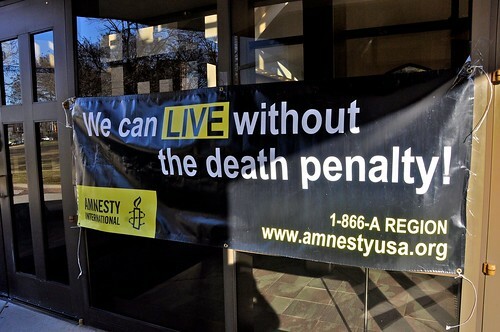 There is no definitive proof that the death penalty deters crime. A study last year showed 4 percent of people sentenced to die are innocent of their crimes. Those who oppose the death penalty argue there is no painless way to kill someone, making it a form of state-sanctioned torture. The death penalty is gruesome and archaic. It’s also racist. People from minority groups are sentenced to death disproportionally higher than the rest of the population. It’s also a costly, long drawn out legal process for states, which would be better off spending more money on education rather than executing people. Oklahoma, unfortunately, has been in the media spotlight on this issue for decades. The majority of its lawmakers through the years have adopted a radical retribution mentality when it comes to crime. This is why the state has some of the highest incarceration rates in the country. Proponents of the bill say death by nitrogen gas is painless, but no one can definitely know that. The only people who would know that for sure would be dead. I’m against the death penalty, but I realize the nation has historically debated this issue and now seems slowly but surely on a path to end it. What seems clear, however, is that Oklahoma’s national image has been damaged recently by Lockett’s botched execution and now its obsession with quickly finding a new way to kill people. With Oklahoma in the national television news these days for a variety of negative reasons, this is something the state just doesn’t need. « But We Have A Web Site . . .